Today's Activities:Arrive in Huangshan City, Flight not included. Upon arrival, you will be met and transferred to the hotel. The rest of the day is on your own. Today's Activities:Transfer you to the foot of the mountain. As you begin to take the cable car to the mountain, you will find yourself among the magnificent scenery. Enjoy the view of the Beginning-to-Believe Peak, the Peach Blossom Valley, the Lion Peak, the Flying-over Rock, the Bright Summit, the Cloud-dispelling Pavilion and the Xihai Grand Canyon. Today's Activities:After watching the magnificent sunrise on the top of the mountain, we will continue to do some walking and see some other scenic sites of the mountain. Then take the cabel down the mountain and head for Hongcun village. It's located in the place which is about 10 kilometers off the northeast part of Yixian County. An ancient town over 800 years old leaning against Mt. 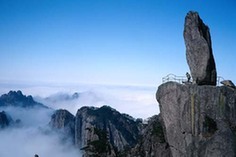 Huangshan, it is folded in the fog of the Mt. which makes it look like a river and mountain picture. 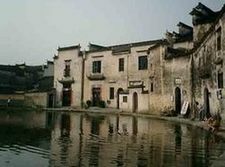 It enjoys the reputation of "The Chinese town in the pictures".